This London Runner Traced Holiday Drawings From His GPS-Tracked Running Routes : The Two-Way Glancing at a map, Owen Delaney noticed a London park's fountain resembled Rudolph's big nose. 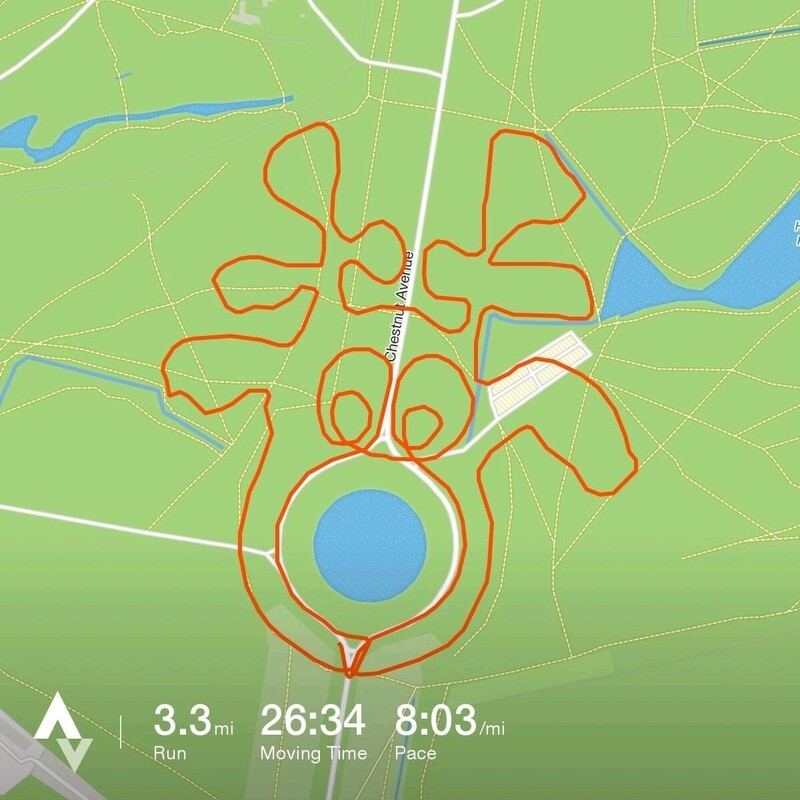 So, he decided to trace the famous reindeer by tracking his run. Then he tackled other holiday favorites. Jolly old Santa himself. Unpictured: the sweat, pain and — possibly? — tears that went into tracing his form on the map. The plan began with an idle thought. 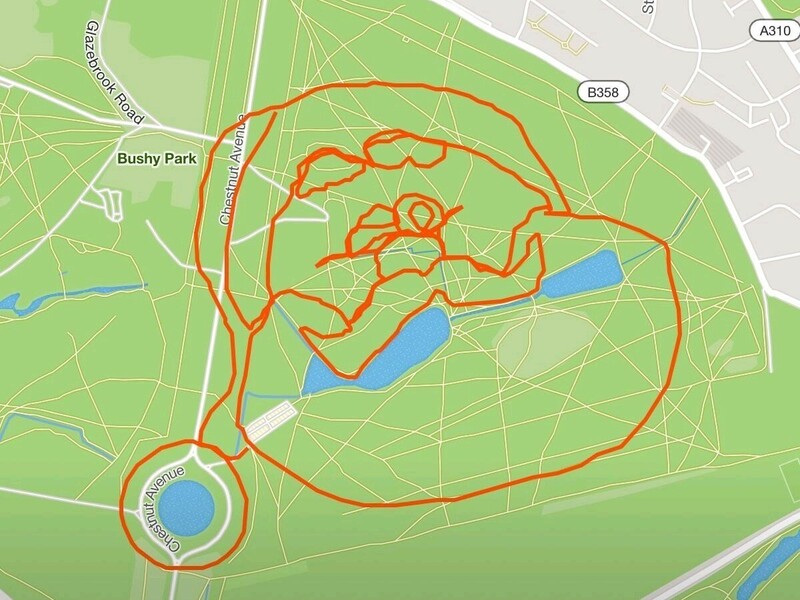 Glancing at a map earlier this month, Owen Delaney realized something funny: Seen from above, the Diana Fountain in London's Bushy Park bears a striking resemblance to the bulbous nose of Rudolph the Red-Nosed Reindeer — at least, it would if that famous nose of his were blue. At any rate, that fountain-nose would look better if seen in the context of a full face. So, Delaney decided to do it himself. The run that started it all: Rudolph the Red-Nosed Reindeer. Well, make that a blue nose — for the Diana Fountain in London's Bushy Park. 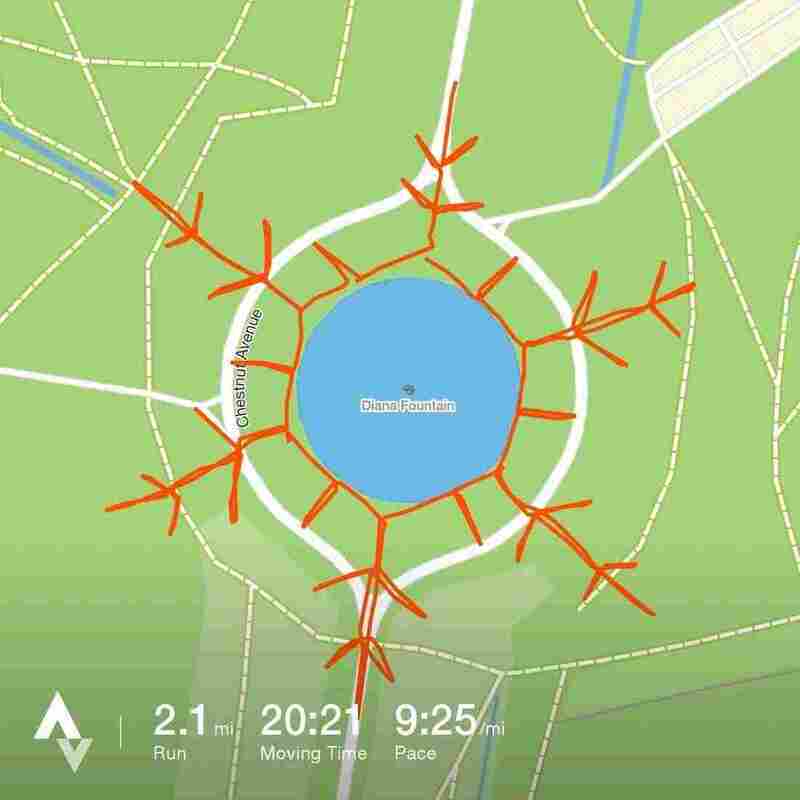 Using Strava, a social network that allows athletes to track and share the routes of their workouts, he traced the path of his run through Bushy Park using GPS. The result was a squiggly (and probably sweaty) take on a favorite holiday character, seen from a bird's-eye view. Then, Delaney kept going. 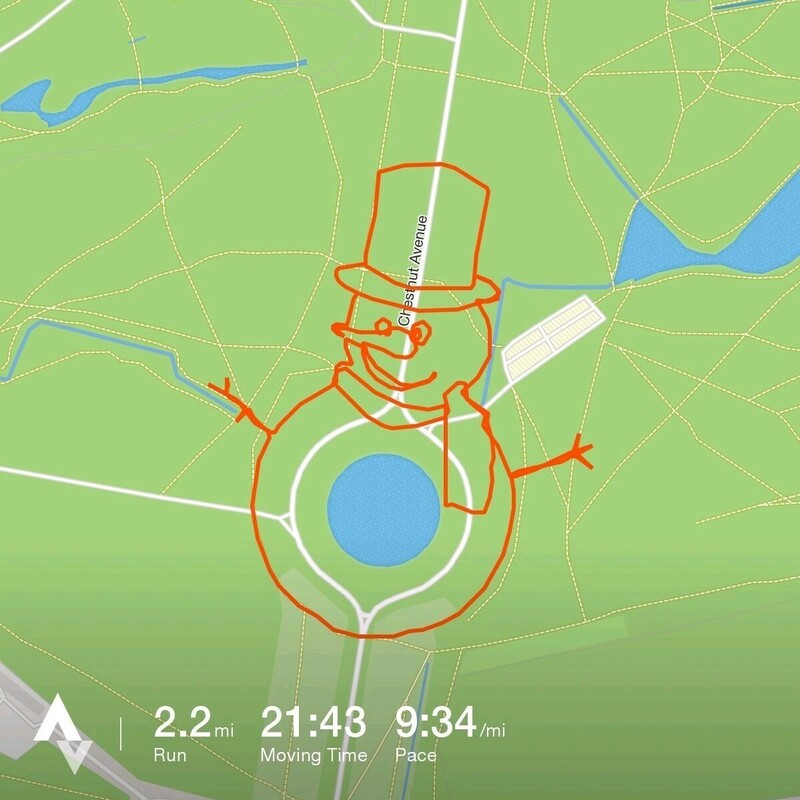 He tried to sketch Santa Claus the next day — an illustration that required a little off-road running. "That was the toughest one," Delaney says. "Trying to run [Santa's] eyes and eyebrows through knee deep bracken, in the dark, it was very unforgiving on the legs! Then I thought, 'Why not try and come up with something different every day until Christmas?' "
And so he has. Each day since that first Rudolph run, Delaney has traced a route and then broken out his running shoes — to ink in the sketch, as it were. 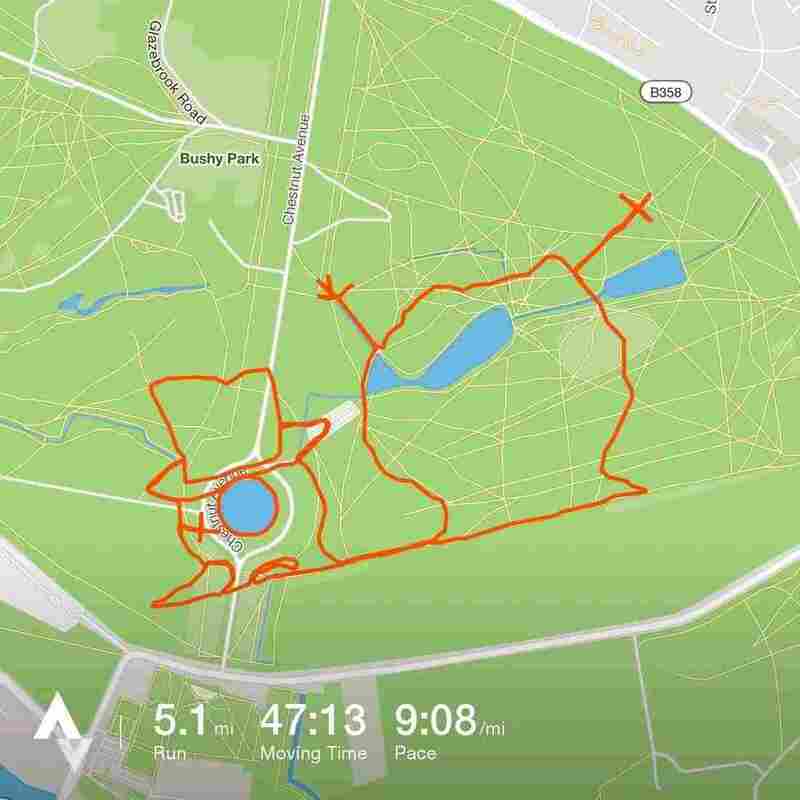 He has drawn an open sleigh, a snowflake, even a sad snowman with its head plopped off. Delaney, a father of two, says he plans to keep going through Christmas, even if his children are bemused by the whole thing. "My kids seem quite confused by it all," he says. 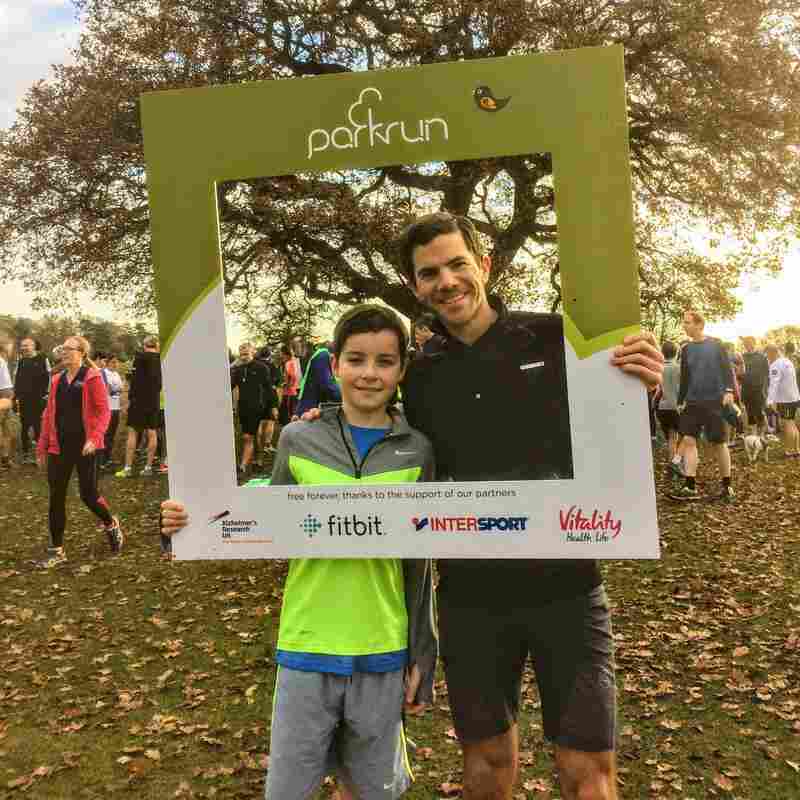 "I show them the pictures after I've done a run, and they just give me a funny look like I've lost the plot. Kids are very astute." Hear that? This isn't child's play, folks. So we expect you to view the following works of art with only the utmost gravity — and sure, maybe a little holiday cheer, too. "I've probably spent a few hours on it in all," Delaney says, "drawing routes for all the runs up until Christmas day, and a few other ideas."